In a world were so few have so much and so many have so little. We have indulged long enough in the oasis that we can just continue to live beyond our means and ignore the needs of those less fortunate. The depletion of natural resources brought about by the greed of governments, corporations and various individuals, has become the fuel which has powered the mass production and consumerism of modern societies. This has left this world with an unhealthy balance and for a great many an unlivable inbalance of power and wealth, which to the extreme has us living in a world were a child dies every 3 seconds. 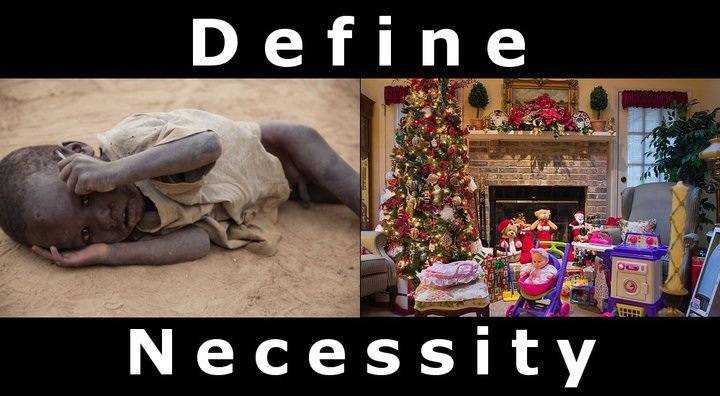 How do we continue to justify and excuse the extravagance in our lives when we know without a doubt that in our world there are those that will live their whole lives in the misery of the neglect of their basic human rights to food, water and shelter. One way in which we can be more aware is in the traditions of gift giving, which without a doubt is one of our greatest displays of overindulgence. longer afford to ignore or remain indifferent to. The throwaway nature of our societies is no more present and obvious than at Christmas time. It has long been the time to shift the focus, time, energy and money from mass productivity of goods, trades and services that, use, abuse and destroy our planet, our environment, our people and our animals in one form or another. By putting our energy and focus into creating a world that is sustainable and fair and encouraging those around us to do the same, there is hope. Teaching our children, the future generations of adults and leaders to come, the value in the principle that less is more. Reminding ourselves and teaching our children that its is in the giving that we receive.